"Notice how we take this cake from traditional to contemporary with its square layer as the base for its round tiers. Sara's floral accents are perfectly arranged. 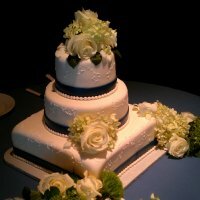 I love this cake for its understated, elegant look. This wedding cake was just the right complement to the ambiance of the Outdoor Art Club in Mill Valley." Copyright 2011 - 2019 | Krumbs Cakes, San Rafael, California, 94901 | 415.320.2400 | All rights reserved.